ETEL’s fuse frame and switchgear system is designed to fit into an LV cubicle of the kiosk substation prior to dispatch, eliminating any additional workshop fitting or on-site wiring. The customer is required to terminate the outgoing consumer cables only. 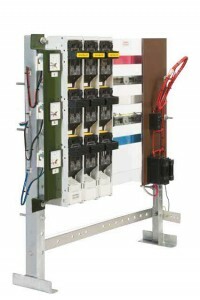 The low voltage fuse frame is designed to suit a specific transformer size, ranging from 15kVA up to and including 1500kVA.